Whisk vinaigrette ingredients together then pour over salad base and mix well. Refrigerate for a few hours before serving. Viola! Yummy vegan veggie deliciousness. And extra points because my husband loves this salad. If a man likes it it passes the food test and isn't just "healthy chick food". What would a serving size be for 1 adult? This is right up my ally. Think I will do a quick pickle the onions for that sweet tart effect. Thanks for sharing. This looks wonderful! When it reads 1 t mustard, is this Dijon mustard or dried mustard (seed)? Looks great - making it for lunch today! This is SOOOOOO good! I just made this for lunch, and I already have plans for this to be a work lunch staple. think i could use chick peas instead of white beans? I added raw kale and let it sit overnight in the fridge. YUM! Just made this, and it is delicious. Made it exactly to the recipe except added a little salt and pepper. Someone else asked about the type of mustard -- I used Dijon. I wouldn't change a thing. All good stuff for you, and really good. Thanks for the recipe! 1 tsp seems like A LOT of mustard powder to mix with under 2 cups of liquid, so I kind of figured it was the mustard you would put on a sandwich. M Haviland - "To taste" means just that. Put a little in, taste it, not enough? Put a little more in, taste. and so on. This recipe was so delicious! I hope you don't mind but I shared a link to this recipe on my blog: http://genkikitty.wordpress.com/2015/05/15/pinterest-winners-losers/. Thanks again for the delicious recipe! I loved this! I did do a tsp of mustard powder, and 1/2 tsp of everything else. I substituted 3 green onions for the sweet onion and added 2 stalks chopped celery for a little crunch, and 2 cups of cooked quinoa. Do I need to rinse the beans? Why do people think it's okay to be mean on the internet? You hurt a REAL persons feelings when you do that. First, if you put RAW beans in the salad, you're an idiot. Canned beans are already cooked for you. Second, if your salad lacked flavor, YOU might have made it incorrectly. This salad is so delicious I'm making it for the second time this week! (Using fresh basil - mmmm) Thanks for the recipe. This salad is great just the way it is, but in the summer when basil is fresh, it's good with fresh chopped basil & a big garlic clove instead of garlic powder! I love how adaptable it is to what is available in your kitchen at that time! Is there a option to add to pinterest? ..its always pleasure to read so....Thanks for sharing!!! I made this to have for lunch tomorrow! I'm doing the 21 day fix, and it's perfect! (for anyone who's on...) I made two separate cups with the can of beans. I put two yellows in each bowl (I got 4 yellows from the can total)...then half of the tomato, half of the onion and using 1/2 an avodcado, put 1/4 in each bowl...mixed the vinaigrette (only used 1 tbsp oil and 2 tbsp lemon juice) and put 1 tbsp in each bowl. I'm super excited as it smelled and looked delicious! I do not like avocado. Has anyone substituted another item for this. This is one of those photographs that makes me want to jump up and make the dish right this minute. I have everything but the avocado, so a trip to the green grocer is in the offing today. Thanks for a lovely recipe. Shared as Recipe of the Day on my Facebook foodie page, Cooking with Whole Grains & Real Whole Foods (flexitarian), pinned, etc. So looking forward to trying it! I'm stopping at the grocery for white beans on my way home tomorrow evening. I have everything else I need...thought I had white beans too, but I must've used them. My husband and I both loved this salad!!! I'm sure I will make it many times this summer. I do have one question, do you drain and rinse the beans? Thanks for the recipe. Pam- so glad you and your husband enjoyed the salad! Yes, I always drain and rinse the beans first! Enjoy! This has become one of my favorites. I use any kind of Italian or Caesar dressing in a pinch - And today as the dressing, I used the new Herdez brand guacamole salsa. OMG That was the bomb.com! I also add cucumbers, bell peppers, carrots, zuchinni, hemp seeds, chia seeds, whatever I have on hand. 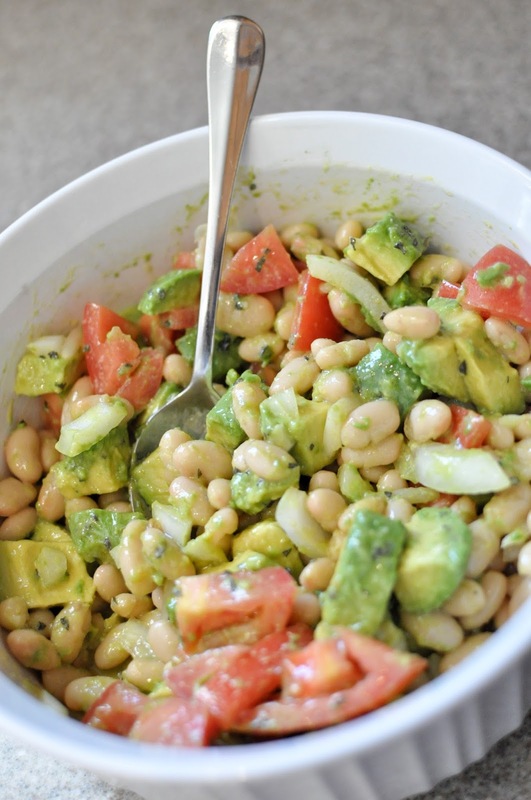 Delicious easy and healthy!